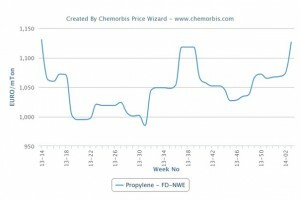 In Europe, spot propylene prices reached the highest level recorded since April 2013 this week as per the pricing service of ChemOrbis. Tight propylene supply as well as stock replenishment activities on the buyers’ side were cited as the reasons behind firmer spot prices. 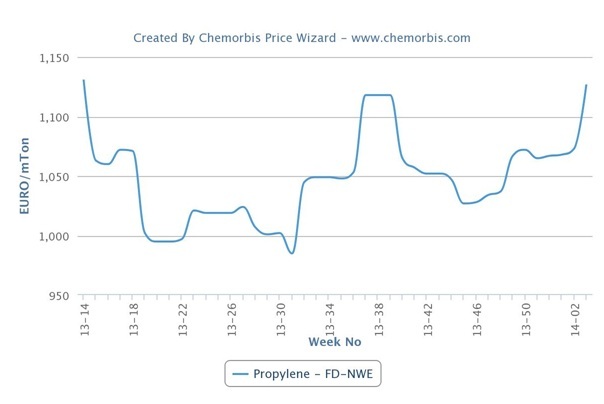 Spot propylene prices jumped around €60/ton week over week on an FD NWE basis and exceeded the €1100/ton threshold despite lack of support from the upstream markets. Spot naphtha prices on a CIF NWE basis are tracking a largely steady trend week over week while they are standing below early January levels. Total Petrochemicals was reportedly experiencing an outage at their Gonfreville cracker in France, according to market sources. The company declared force majeure on HDPE from the same site on December 30, 2013, which was later followed by the PP force majeure declaration on the output from their 230,000 tons/year PP plant at the same site. Sources attributed Total’s recent force majeure declarations to problems related to their upstream production. Borealis is expected to shut their propane dehydrogenation (PDH) unit Kallo, Belgium this week. The PDH unit, which has a capacity to produce 480,000 tons/year of propylene, will remain offline until early March. Several crackers in the region, on the other hand, are resuming operations following planned maintenance shutdowns which may ease supply levels in the upcoming days. In addition, cracker operating rates across Europe exceeded 80% this month after being pegged at around 75% in December due to softer naphtha costs. Therefore, the latest upward momentum in propylene prices may prove to be short-lived. Spain’s Repsol restarted their steam cracker in Tarragona in the first week of January. The 700,000 tons/year cracker was shut for maintenance on October 1. Dow Chemical also restarted their 670,000 tons/year cracker in Tarragona, Spain on January 9 and the cracker is now running at full capacity. The company shut the cracker temporarily in December 2013 citing poor economics. According to ChemOrbis, Naphtachimie’s Lavera cracker in France is expected to reach full capacity in the second half of January. The 745,000 tons/year, which is jointly owned by Ineos and Total Petrochemicals, was shut following a fire in December 2012 and it had been running at reduced rates since March 2013 after resuming operations.